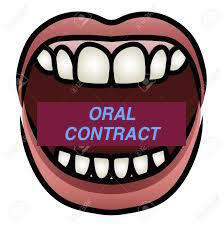 An oral contract is a contract that is not reduced to writing. In certain circumstances, and every disputed circumstance involving an oral contract, it becomes a “he said, she said” as to whether a contract was created and what the terms of the contract entailed. This is why it is always good practice to memorialize contractual terms in writing instead of accepting the “handshake deal” as the manner in which to do business. Also, with oral contracts, the party being sued may argue that the statute of frauds bars the enforcement of the oral contract. The statute of frauds is a legal doctrine that states that an oral contract is unenforceable if it is not performed (or cannot be performed) within one year of the contract’s making. See Fla. Stat. s. 725.01. The statute of frauds does not apply if the oral contract is capable of being performed or accomplished within one year of the contract’s making. However, if there is a lawsuit concerning an oral contract, there is a strong chance that the defendant (or party the contract is being enforced against) will assert the statute of frauds as an affirmative defense. The case of Loper v. Weather Shield Manufacturing, Inc., 40 Fla. L. Weekly D1492a (1st DCA 2015) illustrates an oral contract scenario. In this case, a house was constructed facing the ocean in 2001-2002. The house was constructed with large double-paned windows that came with a 10-year warranty. The owner noticed water intrusion started to occur between the panes of glass and windows began to develop a fogging affect. The contractor tried to correct the issue to no avail. In 2005, a representative from the window manufacturer inspected the windows and some of the windows were replaced. However, the water intrusion and window-fogging issues continued. In 2010, a meeting was conducted with the owner, window manufacturer, window installer, and contractor. During the meeting, the owner separately spoke with the representative from the window manufacturer. The representative explained that if the owner had a lawyer he was not going to be able to help the owner to which the owner replied he did not have a lawyer but plans to seek legal action if the problem does not get resolved. The owner stated that he wanted the defective windows replaced and wanted a new 10-year warranty (the original warranty was set to expire at the end of 2011). The representative responded that he would relay the request to his bosses; he subsequently contacted the owner to confirm there was a deal. The owner asked for the terms to be put in writing and the representative said his company’s legal department would prepare the agreement. The owner never heard back from the representative. After calling many, many times, he discovered that the representative had been laid off. The owner then spoke with another representative that told the owner that he approved the deal and he would check on the status of the settlement agreement with his company’s legal department and get back to the owner. Of course, this did not occur. The owner followed-up with this representative and never received a call back. By August 2011, and with the original warranty set to expire, the owner was still following-up with the manufacturer to reach a longstanding resolution to his window issues. Finally, approximately a month before the owner’s original 10-year warranty was set to expire, the owner received an e-mail from the manufacturer saying it will not extend the 10-year warranty and, thus, was reneging on the terms of the oral agreement between the parties. The owner filed a lawsuit against the manufacturer claiming that the manufacturer breached an oral contract where windows would be replaced and a new 10-year warranty furnished. After a jury trial, the jury returned a verdict in favor of the owner finding that there was an oral contract. However, the judge directed judgment in favor of the window manufacturer finding (1) there was insufficient consideration for the oral agreement between the owner and manufacturer and (2) even if there was consideration, the statute of frauds barred the enforcement of the oral contract because the contract required a new warranty that extended beyond one-year. On appeal, the First District Court of Appeal reversed directing entry of judgment in favor of the owner on the breach of oral contract claim consistent with the jury’s verdict. Although the owner prevailed on his breach of oral contract claim, it is always good to reduce the terms of an agreement (any agreement) to writing. The owner prevailed because he was probably a good witness that told a persuasive story to the jury that the jury found to be credible. It is the owner’s story of events the Court focused on since the owner received a jury verdict in his favor (and was the party appealing). Hence, having a credible, persuasive witness always helps! Here, the owner’s counsel was creative. The owner’s counsel knew the owner could not sue the contractor or even the window installer because the statute of limitations expired. But, there was a colorable claim that could be asserted against the window manufacturer based on the outcome of a meeting that took place involving the owner and manufacturer. While this oral contract claim is certainly a difficult and probably expensive claim to prove, the owner prevailed on this claim (although, it is uncertain as to what expense meaning did the owner recover more than he incurred in legal fees and/or did he create an argument to recover attorney’s fees by serving a proposal for settlement). It is uncertain why it took the owner so long to retain counsel to deal with a persistent water intrusion and window-fogging problem. The owner should have retained counsel earlier to best preserve his rights. Although the owner was able to show that his wiliness not to retain counsel supported the consideration for the oral contract, forbearance from pursuing legal rights should not come across as unreasonably indefinite or illusory. Here, the Court found that the forbearance was intended to be brief but was simply extended based on the run-around given by the manufacturer up until the point that the manufacturer knew the original warranty was expiring. This entry was posted in Contract Drafting and tagged contract consideration, Florida Statute 725.01, forbearance of lawsuit, oral contract, oral settlement, statute of frauds by David Adelstein. Bookmark the permalink.